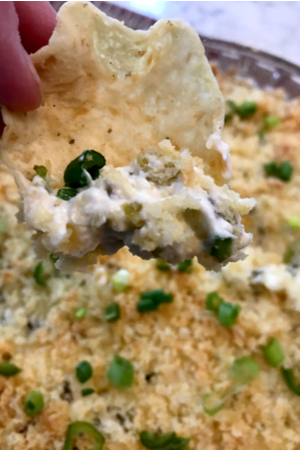 No matter what party we attend, one of the most requested appetizer that I am asked to bring is loaded jalapeno popper dip. I always thought my pigs in a blanket, buffalo chicken dip and spinach artichoke dips were the hit of the party. Loaded jalapeno popper dip on a tortilla chip. 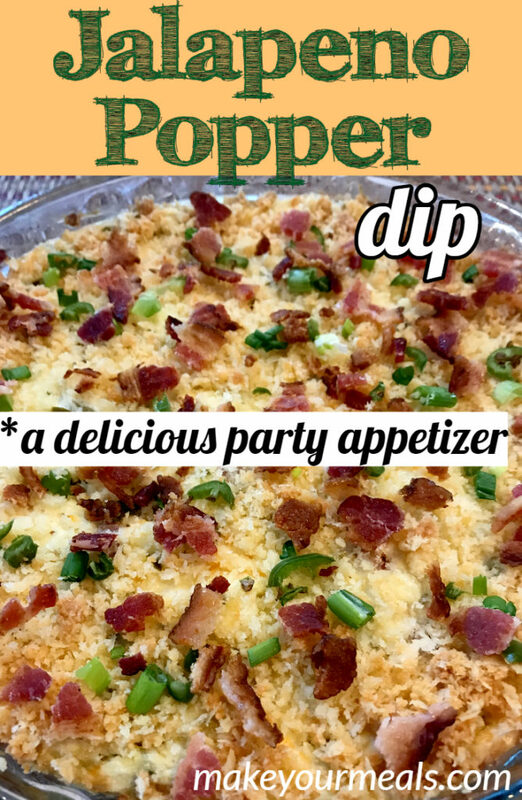 However, every time that I bring my loaded jalapeno popper dip, everyone raves about how delicious it tastes. When one of my friends asked me for the recipe, I had to ask her why she thought it was such a hit. She explained that everyone is used to the standard, go to appetizers. Think about the parties that you attend. I know it varies upon geographical location, but there are always appetizers that you can bet will be on the buffet table. For us, it is buffalo chicken dip, chicken wings, meat and cheese plates, salsa, hummus and guacamole. Be sure to warm your cream cheese to room temperature before mixing. Sure you also get your veggie and fruit trays, and if you are lucky, someone brought appetizer meatballs. But when you make something just a little different, such as the loaded jalapeno popper dip, everyone wants to give it a try. For those that don’t like the heat of classic jalapeno poppers, don’t stop reading now! 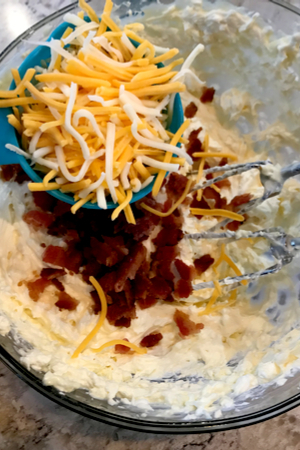 Adding the bacon and cheese makes this dip amazingly delicious! This dip takes all of the classic flavors of cream cheese filled jalapenos that have been coated and deep-fried and puts it into an easy to eat spread. No more biting into a jalapeno popper, only to burn the roof of your mouth with hot oil or scalding cheese that was waiting inside. This loaded jalapeno popper dip gives you the experience of biting into the classic appetizer but without all the risk. The true question is the actual dip hot or not? And by hot, we mean spicy hot. Using canned jalapenos and green chiles makes this dip bearable for all. The first instinct is to answer that question with “Absolutely”!!! I mean, it is made with jalapenos and green chile peppers after all. But wait! 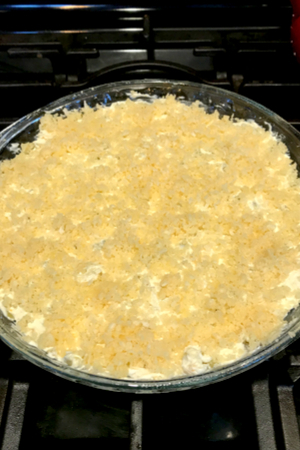 Because this dip is made with a variety of cheeses, the heat level automatically gets significantly reduced. And to make it even more edible to the common person, we used canned jalapeno peppers and green chiles instead of using fresh ones. Canned peppers have the stems and ribs removed prior to packaging. This is where all heat comes from. 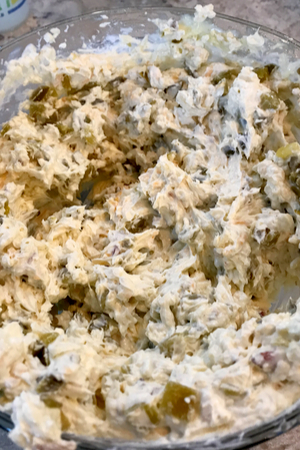 Of course, if you are making this loaded jalapeno popper dip for you and your friends and family you can adjust the heat level to your preference. The crunchy topping is made with Panko breadcrumbs and Parmesan cheese. When I make it for a pot luck or party at work, I stick to using canned peppers. However, when I make this for a tailgate party for our friends, I will add in some diced up jalapeno peppers as well – seeds and all! When I first created this dip, I wanted to replicate the classic taste of jalapeno poppers but in a dip form. I used cream cheese as the base and added some shredded cheese to thicken it up a little. I then added diced jalapenos and topped it with breadcrumbs to give it that crunchy coating. The topping has been added and the loaded jalapeno popper dip is ready to be baked. It was delicious, but I knew that a little more flavor would go a long way. Then it hit me! One of my favorite ways to make true jalapeno poppers to to wrap them in bacon. So it made total sense to add diced bacon to this dip as well! For additional heat, add some diced jalapenos as a garnish. 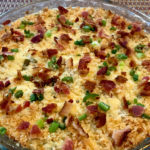 Bacon, a few extra spices, a garnish of green onions and diced jalapenos and we had made the perfect loaded jalapeno popper dip! When we make this dip we typically serve it with nacho chips. But not always. This dip is also delicious when eaten with corn chips and/or crackers. And if you are trying to keep things low-carb or Keto-friendly, skip the breadcrumbs and use celery instead of chips. 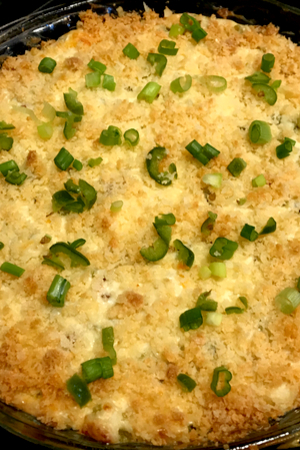 However you choose to make your loaded jalapeno popper dip, be sure to share with others. You will be the star of the party! Creamy and cheesy jalapeno popper dip – gives you all of the flavor of jalapeno poppers in an easy to eat dip. Preheat oven to 350 degrees F. Spray a 8 inch pie dish with non-stick cooking spray, set aside. 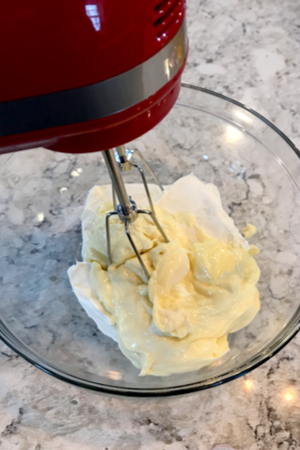 In a mixing bowl add room temperature cream cheese and mayo and beat until smooth. Add jalapenos, green chiles, and mexican and mozzarella cheeses and ½ of the bacon to the bowl and mix well until combined. Spread the mixture into the prepared dish and smooth until even. 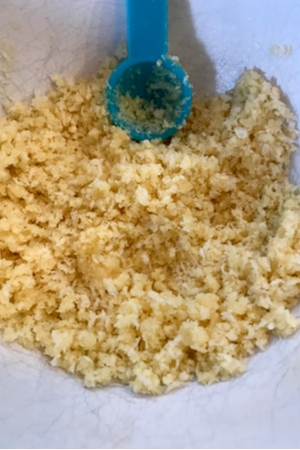 In a small bowl add the panko breadcrumbs and Parmesan cheese. Pour melted butter on top and mix well. Sprinkle mixture over the top of the dip. Sprinkle remaining bacon crumbles on top. Bake for 25 minutes, until panko is beginning to brown and dip is bubbling. Add green onions and fresh jalapenos on top for garnish as desired. Serve hot with tortilla chips, crackers or sliced veggies.